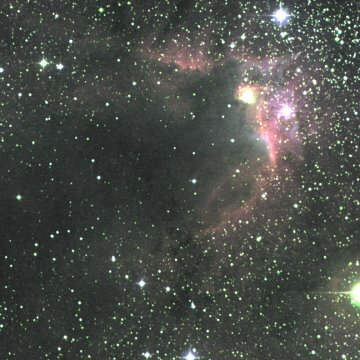 The Cave nebula interacts with the Cepheus B molecular cloud and is ionised by stars that belong to the Cep OB3 association. Sharpless lists 9 potential ionising stars, including the B0 class HD 217086. SIMBAD says that this object is actually a O7 Vn class young stellar object with multiple components. Avedisova places Sh 2-155 in the massive star formation region SFR 110.15+2.61 and lists 157 components, including 24 masers, 48 infrared sources and the dark nebulae LDN 1211 and LDN 1216. You can read more about the history of star formation in this region in the Cep OB3 section of the description of the Brain and Bubble (120° - 110°) sector in the Commentary on the Galactic Plane. A good image of this nebula can be found here. You can also view an interesting false colour MSX 8 μm infrared image of this region here.